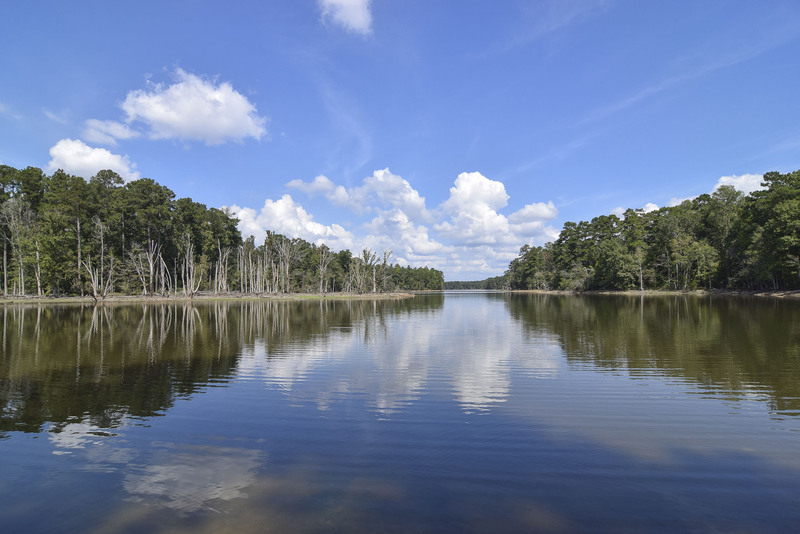 4214 Highway 378 is located in Leesville, SC with 26 acres on Lake Murray, SC. It is 15 miles west of Lexington, SC and 25 miles from Columbia Metropolitan airport, Columbiana Center or Lexington Medical Center. The home was built in 1990 and has cedar siding with wrap around porches and matching detached garage with heated and cooled recreation room overhead. There are his and hers offices on either side of the foyer. One has built-in cabinets and book shelves and could be a formal living room and the other could be a formal dining room if desired. 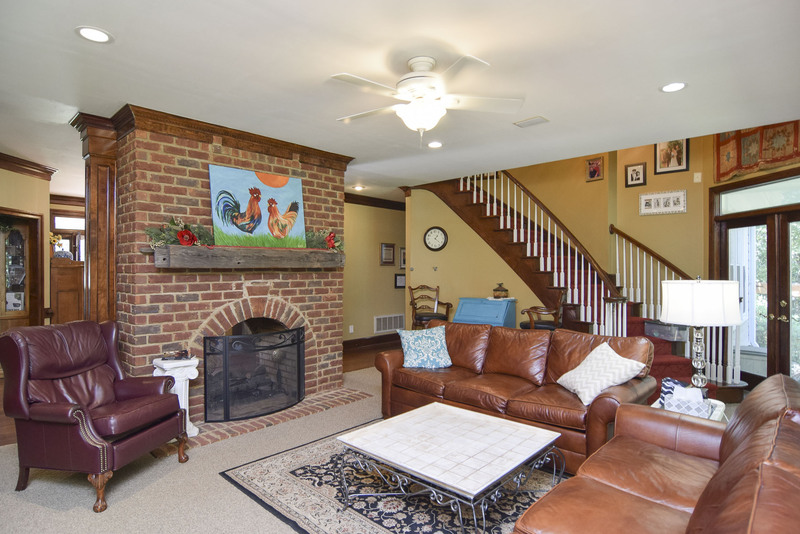 There is a beautiful two-sided brick fireplace that delineates the entrance from the family room. When the home was built, the column that is next to the fireplace was the support beam where the wall currently separates the large eating area from the family room. If you want that open concept, remove the wall and put the column back as support. 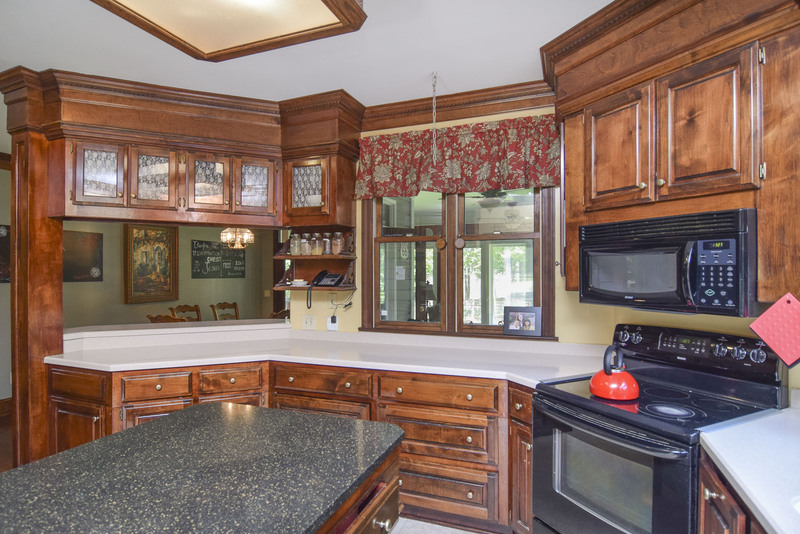 The kitchen has solid surface counters, solid wood, dark-stained cabinets and a center island with granite top, as well as, a pantry/mud room. There is a bedroom and bath on the main level. There are genuine hardwood floors and dentil molding throughout most of the first floor. 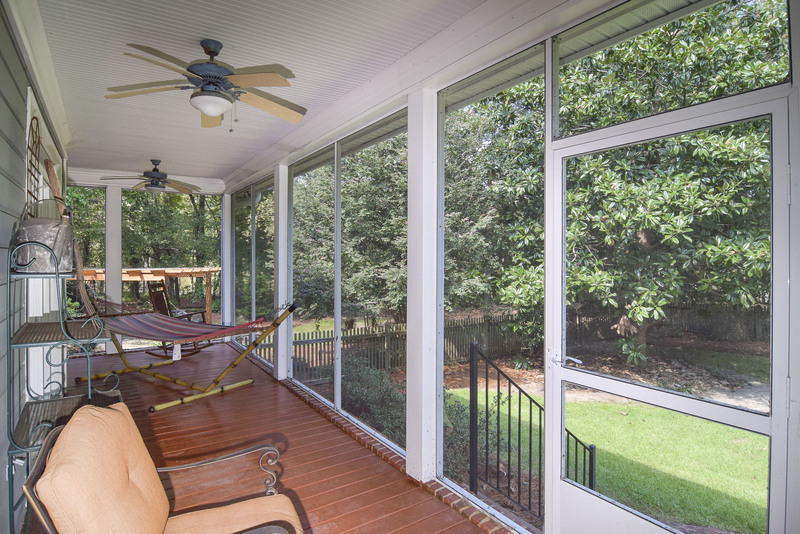 A screened porch and sunroom with tiled floor offer extended living areas and opportunities to enjoy the sights and sounds of beautiful Lake Murray. Up the curved staircase with wood treads, there are three large bedrooms, each with walk-in closet, two baths, laundry room, sewing/hobby room, and master bedroom with large walk-in closet and recently renovated private bath with large vanity and two sinks, garden tub and separate shower. The toilet is tucked behind a privacy wall. This home has smooth ceilings throughout (9 ft on 1st floor), tankless water heater, central vacuum, central heating and air, generator, well and septic, and high speed Internet. The yard surrounding the house is beautifully manicured with plush grass, picket fence, patio with pergola, stacked stone border wall, trellis, and goldfish or koi pond. There is a 35 x 18 shed, perfect for camper. Lake Murray supplies water for irrigation for the full yard and pastures. There is a 75 ft vegetative buffer along the water’s edge. There is a sandy beach area and dock with an encapsulated plastic floating dock. When Lake Murray is full at 360 feet above sea level, there is approximately 10-12 feet off the end of the dock. A typical winter low is 354-355 feet elevation and a spring/early summer high elevation is about 358-359 feet elevation. Throughout time, people, including great philosophers and theologians, have attempted to define HAPPINESS. According to Merriam-Webster, happiness is a noun defined as “good fortune” or “a state of well-being and contentment; a pleasurable or satisfying experience.” 4214 Highway 378 in the midlands of South Carolina provides a lifestyle that nurtures happiness because it allows for fresh air, wide-open spaces and a slower pace of life. According to an article, “5 Surprising Benefits of Country Living…” written for the National Association of REALTORS by Kimberly D Neumann, those who commit to life in the country will reap scientifically proven benefits. This property provides a slice of country heaven. Take the ½ mile winding, paved driveway through approximately 20 acres of virgin, mostly level, forest brimming with nature. Hunt deer and turkey on your own property. Throw out some decoys on either side of the 1500 feet of waterfront and hunt ducks from your own property. Fish for bream, catfish and bass in the deep water channels of Rocky Creek that run alongside your property. 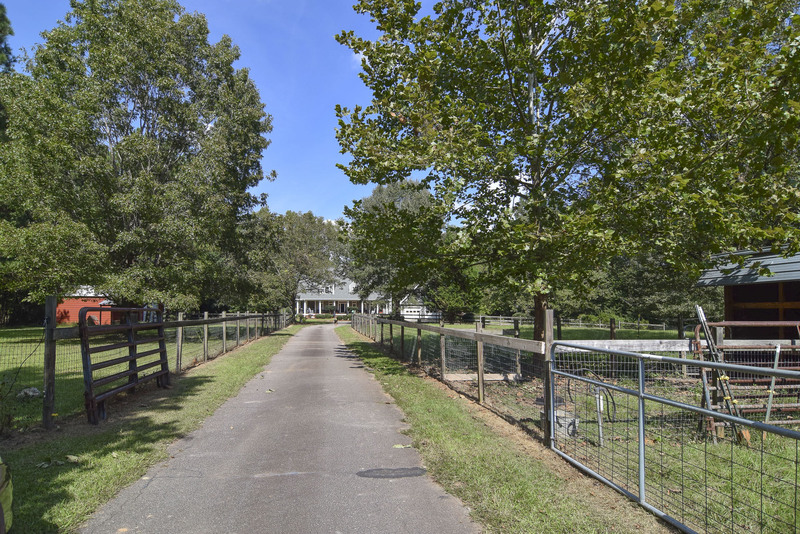 Have your own gentleman’s farm or with three chicken coops, approximately four acres of fenced pasture, 30 x 24 pole building/detached garage, horse’s loafing shed, raised vegetable beds, and more, you could easily live off of the land. The current owners have goats and chickens, and have had horses in the past. Lake Murray SC Real Estate - The Sallie Chester Team of Exit Real Estate Consultants​With an emphasis on real estate sales on Lake Murray and off-water properties in Lexington, SC and surrounding areas, Sallie Chester and her team of professional REALTORS® utilize EXIT’s cutting edge technology along with old-fashioned customer care to provide each client with exceptional service. 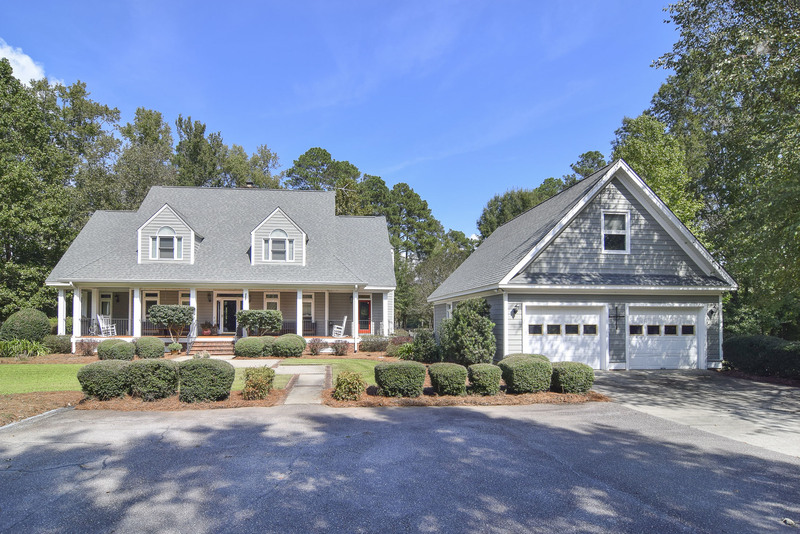 Sallie lives on Lake Murray, just 6 miles from 4214 Highway 378, Leesville, SC 29070 and with many years as a leader in the real estate industry, her clients value her knowledge, professionalism, and business experience.